Dr Gupta spent five months helping victims of the Tsunami in India. He is available to help/consult. 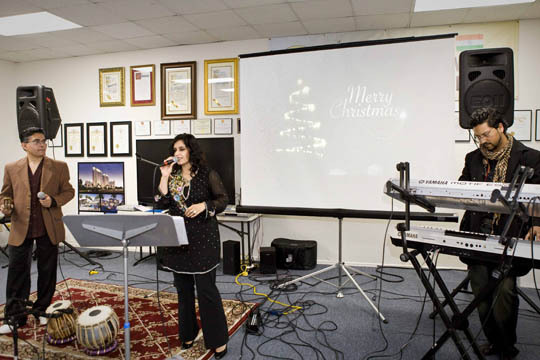 For the First time in history of Little India (Artesia) the non Christians also celebrated the unique Christmas Party. 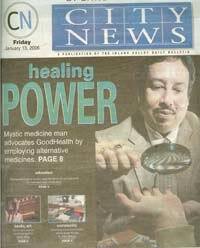 Kevin Kaul is a well known dynamic leader of the Asian American community. 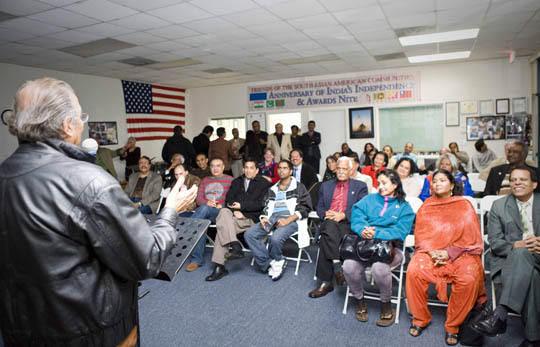 Under his banner of Friends of South Asian Association's Collaboration the party was organized. Under the banner of FOSAAC there are sister companies which help the community to improve in their cultural, business and networking. From local small businesses to multinational collaborations FOSAAC provides expert advise. The spiritual leaders from various religion were the stars of the party. Dr. Sunit Kumar Gupta ,his wife Mrs. Sarita Gupta and daughter Miss Hersheeta Gupta, Pundit Vinod Dave, Pundit Sidharth Pathak, Dr. Praveen Syal, Shri. Chopin Chopra, Shri Ravi Shanker, Shri Kevin Kaul and other well known dignitaries represented the Hindu Community. Pastor Wallace and his congregation represented the Christian Community. Mr. Amin Faruqui, Mr. Hashmat Malik of Prime Time Travel, Mr. Abdul Shariff, Mr. Sultan Allaudin represented the Islamic Community. "This is the first Christmas Party held in Little India" announced Kevin Kaul "We wanted to inform the community that we respect all the religions and celebrate all the festivals"
Dr. Sunit Gupta the prominent Hindu leader and legendary astrologer, reinforced Kevin Kaul's vision by stating " I believe in Universal Brotherhood. God is one but the ways to be in harmony are different. This is a great step of FOSAAC to celebrate Christmas"
Pastor Wallace and Dr. Gupta did the ceremonial prayers. Rev. Wallace conducted the cultural program. 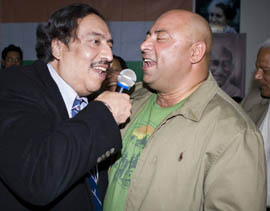 Leena Benjamin (Benjamin Sister's Fame) and her brother of "Kaarvan" group had their professional orchestra and singers. The evening was enjoyed by everyone with new and old Hindi songs followed by tasty traditional dinner catered personally by Mr. Darshan Singh of Ashoka restaurant. 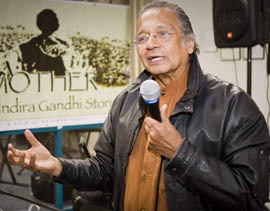 Krishna Shah, producer of the upcoming movie "The Mother- Indira Gandhi" spoke about his life in America and gave a preview of the movie. He mentioned about his patriotic belief and his being proud of an Indian. "During the beginning of my carrier. My agent had suggested me to change my name to Chris Shaw instead of using my real name . I am proud of being Krishna Shah and am known worldwide with my typical Indian name. I want to give the gift of the movie "The Mother : Indira Gandhi" to my motherland from all of us NRIs and also I am proud to announce my Associate Producer of this film to be the rising Star of the Asian Community, Mr Kevin Kaul, he reiterated to all. The audience was surprised when Rev. 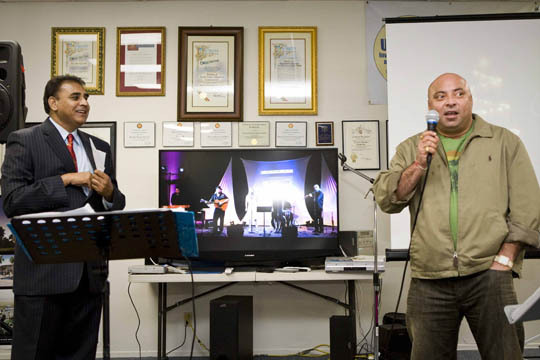 Wallace invited Dr. Sunit Gupta to sing on the stage. The tear drops twinkled in Dr.Gupta's bespectacled eyes and even tears rolled out from the eyes of audience when Dr. Gupta sung the song from Shri. Rabindra Nath Tagore's famous movie Kabuliwala : Ai mere pyare watan, Ai mere Bichrey Chaman ; tujhpe dil kurbaan"
To change the mood into the Christmas Gupta sang "Zindagi Ek Safar hai Suhana, Yahan Kal Kya Ho Maine Jana"
Krishna Shah was so impressed with Dr. Gupta's singing that besides offering him a role in his movie. He also requested him to sing in the movie and promised an audition. Watch Dr Gupta’s latest commercial which you may have already seen on tv. 70% Off in Genuine, MONEY BACK Guaranteed Natural Astrological Gemstones. "Vaastu" and " Lucky Tips"
Mr Deep Roy of Oompa Loompa & Charlie's Choclate Factory graces our stand.